You spent hours dashing through the snow, searching for an open parking space in the over crowded lot, braving the frigid winter wind, battling your way through the overcrowded aisles of your local stores, rummaging through stacks of this and that on showroom shelves, standing in long check out lines and trying to remain calm while dealing with overworked cashiers, and when it was all said and done, you thought you had found the perfect Christmas gifts. After spending hours neatly wrapping your gifts and carefully placing them underneath your Christmas tree, you took a deep breath, certain that finally, you had come up with the best Christmas gift ideas ever. 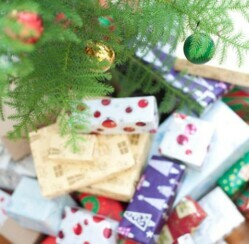 Low and behold, on Christmas morning as your loved ones anxiously unwrapped their gifts, you suddenly realized that nearly every gift was actually a duplicate of something the recipient already had, just received or never wanted in the first place. Has this ever happened to you? After a few times of this very scenario happening to me, I decided to take it upon myself to ask the gift giving expert himself- Santa Claus- how to go about finding the most creative, useful or most desired Christmas gift ideas for my loved ones. Much to my surprise, he informed me that all of my Christmas preparations could be done while sitting in my favorite pajamas, drinking eggnog, and listening to my collection of Christmas tunes! With the help of my trusty laptop, you can bet that I got busy in a hurry, and before you know it, not only had I found some really great Christmas gift ideas, but I had located a number of unique merchants, placed my orders, and completely finished my Christmas shopping adventure for the year! If you’re ready to experience Christmas shopping in a whole new way, you are searching for creative Christmas gift ideas for your loved ones or you are looking for unique Christmas decorations and accessories for your own home, get your eggnog ready, and I’ll show you around. I’ve even added a few Christmas gift ideas of my own in order to get you started! Before you ever get started, it’s a good idea to make a list of who you intend to buy gifts for, what their special interests are, and familiarize yourself with Christmasgifts.com and select the category that most closely matches the type of gift you are looking for. As an example, if you are searching for gifts for your sister, select “Christmas gifts for women”. Browse through the unique items listed, and when something interests you, simply click on it! If you like the type of gift you are viewing, and you would like to see more like it, simply click on the red “SHOP NOW” button. The link will take you directly to the merchant’s product page, and from there you can browse around through the rest of their product line, opening up fresh new ideas. If you can’t find what you are looking for, click on the link for unique Christmas gift ideas at Christmasgifts.com for more options. What has your experience been like when shopping online? Do you have suggestions that would help to improve your online shopping experience?